California Democrats Sen. Dianne Feinstein and U.S. Rep. Zoe Lofgren recently reintroduced bicameral legislation to protect farmworkers from deportation and put them on a path toward earned legal status and eventual citizenship. Under the proposed Agricultural Worker Program Act (AWPA), farmworkers who have worked for at least 100 days in the past two years may earn blue card status, another recycled concept, that allows them to continue to legally work in the United States. Farmworkers who maintain blue card status for the next three years or five years, depending on their accumulated hours, would be eligible to adjust to lawful permanent residence or green card status, and to eventually apply for citizenship. The Feinstein/Lofgren bill has significant and growing support in both chambers, and the United Farm Workers, the UFW Foundation and Farmworker Justice organizations heartily endorse it. Without question, farm labor is demanding, and unappealing to a wide swath of job-seeking Americans. But the Feinstein/Lofgren bill is a temporary non-solution, a band-aid that provides more incentive for illegal immigration. And forgotten, or at least not included in the AWPA, is that once ag workers come north, they often gravitate into higher paying jobs like construction, factory or office work. Americans will do those jobs, but would face stiffer competition once thousands of foreign-born workers receive federal employment authorization documents. The permanent answer is mechanization, adopted worldwide, but a process that California and other big ag-producing states have been deliberately slow to embrace. Readily available pliant cheap labor means less enthusiasm for mechanization and its high start-up costs. 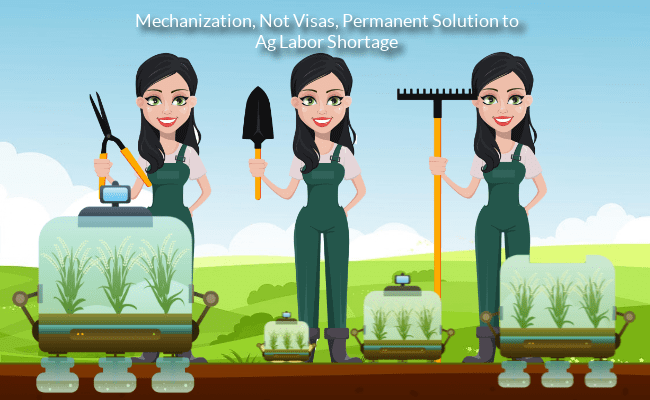 But ample evidence proves that when real or perceived labor shortages exist, growers have successfully changed course from stoop labor to mechanization. Last summer, Napa Valley grape growers and UC Davis agriculture specialists said that mechanization is today’s reality. Machines do everything. As a result, the cost to manage a vineyard comes to about 7 cents a vine, “as cheap as it gets…,” according to a UC Davis analyst. One machine handles 200 acres, and wine enthusiasts report no quality drop-off. Dairies in Vermont, Utah, Indiana and other states use robots to milk their cows. Robots can work 24/7, and don’t require food or housing. Every year, growers and congressional representatives from ag-dependent states make the same specious claims: that crops are rotting in the field and that more imported labor is needed immediately to save the growers. Ominous predictions abound. More than a decade ago, Sen. Feinstein, promoting her AgJobs bill, declared California’s exaggerated farm labor shortage “an emergency,” and said, “If you can’t get people to prune, to plant, to pick, to pack, you can’t run a farm.” Earlier, Feinstein prophesied that the hyped labor crisis would cost California taxpayers $3 billion in the short-term, and $4.1 billion over the long-term. Neither of Feinstein’s dire predictions came true, but politicians make similar claims every year, and the media reports them as gospel. As for AWPA’s supporters who insist that without farm labor Americans would be paying $20 for an avocado, agriculture economists concluded that labor is such a small factor in food’s final retail cost that “entirely eliminating the illegal workforce would raise farm wages substantially – 30 percent in the short term and 15 percent in the long term – but would raise prices only a tiny amount, from 6 percent in the near term to about 3 percent in the long term.” That’s because labor is a relatively small part of the cost of food, only about 7 percent for labor-intensive crops. A full and honest accounting of the AWPA would point out that the bill ensures that temporary ag workers will remain stateside forever, likely become parents to American citizen children, receive affirmative benefits and, once eligible, sponsor about 3.5 family members from abroad. AWPA’s high price falls on taxpayers while the agriculture industry reaps the profits. This entry was posted in Employment and Immigration, labor and tagged blue card, h1-b, illegal farm workers.